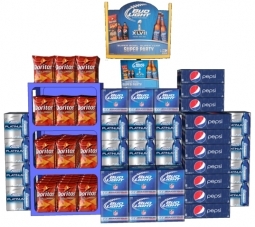 Everything you could ever need — assuming you only drink Bud Light, Pepsi and eat Doritos. Sick of going separate sections of the supermarket to buy beer, soda and snacks? Then the folks at PepsiCo and Anheuser-Busch InBev N.V. have created the monster one-stop display for you. AdAge reports that the two beverage biggies have joined forces to create promotional displays that sell Bud Light alongside Pepsi drinks and PepsiCo snack brands like Doritos. There is also talk of a coupon that could save customers $8 being involved in this display, though it seems to involve a mail-in rebate, which instantly takes the winds out of most consumers’ sails. We’d like to see makers of painkillers, antacids team up with debt councilors to provide their own post-Super Bowl display for the folks who might overindulge and/or bet on the wrong team on Feb. 3.